Why Thoughts inspired by Age of Conversation’s Douglas Karr. Primarily, there was a need for an XML/OPML file for india focussed blogs. 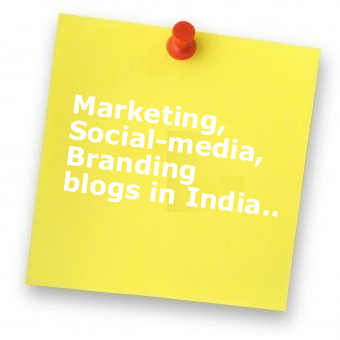 Who All blog-readers who enjoy following trends/thoughts/insights/analysis on social-media, marketing and branding trends in India. How Simply use the import feature in your feed reader to import from these blogs. Abhishek Jha, Anjali, Daksh, Dhivya Subramanian, FMCG & RETAIL Marketing, Gaurav Mishra, Gaurav Shukla, Harish B, Jessie Paul, Manish, manuscrypts, Pallavi Bhardwaj, Preeti Chaturvedi, Rajesh Aithal, Rajesh Kumar, Rajesh Lalwani, Rajiv Dhingra, Ravi Kiran, Sampad Swain, Saurabh Garg, Vandana Ahuja, Vikas Tandon. Its ‘Holi day’ and what better way to celebrate the festival of colors with visual representation of Marketing, Advertising, Public Relations and Branding. Liked it so much, couldn’t resist sharing with you. “Chak de India” is a big hit and experts are terming it as Shahrukh Khan’s best movie ever. Probably it is time for Indian sports authorities to get into the act and ride on the movie’s success. Get some sponsors, promote the game & use Chak de India as a marketing tool. Itasveer : India’s Best Photo Printing Website ? In a brief e-mail discussion with me, Ankit Khanna, Director itasveer, revealed itasveer’s new features, why it is different from other online photo printing services in India and its future plans. Packed with cool features and top partners itasveer appears to be doing better than other online photo printing services like picsquare, fobaz. Gradually consumers appear to be moving away from the traditional methods of photo printing. Typically, I’d like to apply a different thought and would instead like to focus on key differentiations of itasveer from Picsquare which are user-centric. Over time, itasveer has established itself as one of its kind product in the online photo printing segment in India and outside India (presently our focus is India only). Our approach is led by innovative thinking – whether its UI, new product, or any new feature. 1. Doodlepad is definitely the biggest differentiators. When we thought of introducing the merchandise, we thought why not develop a tool which empowers our users to come up with their designs. This led to the development of online design tool called Doodlepad ( http://www.itasveer.com/godoodle.do) It gives us the edge in technology and better user experience. Users can mix up designs, add clipart, background, frames, and get designs printed on t-shirts and mugs. A product from Bangalore based mobile startup “Motvik”, WWIGO stands for “ Webcam wherever I go”. WWIGO allows camera phone to be used as wireless webcam through bluetooth. Currently, it supports only N Series and other Nokia phones. The transmission quality with WWIGO is at par with a home webcam and it can be used with Skype, MSN, Yahoo IM & Video sharing websites. Definitely worth checking out..
A search engine with a human touch as it provides the features of collaborative searching. Users have the flexibility to edit the search results and save them according to their preferences. Thus next time users search for similar queries they’d see humanized results…. the advantage being user powered search results. A popular & handy desktop RSS reader by my kool company, you would simply love to have. i-Fetch, a powerful RSS Reader & Aggregator scores over other desktop feed readers as its a free utility and provides offline reading which is missing in online readers . An easy to use compact application well equipped to handle individual’s reading needs effectively. Rajesh Barnwal’s Alootechie creating online waves!! Fortunately/unfortunately I stumbled on a website called Alootechie nopes its not (Alootikki) Aloo + Tikki as explained here by rajconteur clearly. I could see a picture of a bespectacled man towards the right of my browser’s page, when the website Alootechie had finished loading on my browser. According to Raj’s blog ( he has stopped* posting there!!) Alootechie is a new age website, which aims to cover IT news that interests and matters to a layman. From the look and feel Alootechie is like a typical newspaper( except for the fact it is online!!.) Yeah, there is one GIF image which highlights the jobs section of the portal. ( Off-course Rajesh Barnwal is there in the GIF). From a reader’s perspective I like Alootechie simply because of the quality content of news. “No crap all gyaan” that’s what Alootechie means to geeks, students & online junta. Most recently I’ve skipped reading tech. news in papers b’coz I know Alootechie is going to cover that. As always you can visit the website http://www.alootechie.com. The search functionality of the website can be improved, since it is a content-focused site. M/S error towards the bottom-right of the screen is one of the blemishes on the website.